If you let someone handcuff you, and put a rope around your neck, don't act all surprised if they hang you! Forget about winning and losing; forget about pride and pain. Let your opponent graze your skin and you smash into his flesh; let him smash into your flesh and you fracture his bones; let him fracture your bones and you take his life. Do not be concerned with escaping safely - lay your life before him. Noah was a big budget movie too, but given that it was an Aranofsky film it doesn't come across as a paycheck/stay relevant film like Beauty and the Beast. She's next up in Greta Gerwig's Little Women adaptation, which is a certainly intriguing project. Watching 1983, a Polish-American mini set in an alternate world where the Iron Curtain survived past the 1980s, as consequence of a set of terror attacks by an anti-communist group that strengthened national unity in the East. The mini is set in the 2000s when a nosy Polish cop and a uni student start to uncover a conspiracy that involves the higher echelons of the Polish communist regime. It's very intriguing, although I hope there's more twists and turns to the story, since by episode 2 one starts getting a good idea what the conspiracy is about. I find interesting that there's barely any commie symbology or ideology featured in the show (the show features a lot of political philosophy but always along the ways of stability vs liberty), so instead of feasting on Ostalgie the show tries to depict any hypothetical authoritarian regime in the developed world. She's a pretty good actress, and yeah I think she has a bit of freedom to take on roles she likes. Overall I think she's the best of all the Potter kids. Speaking of I'm gonna spend the Christmas vacation binge watching the whole series. Tried that a while back and ran out of steam around 4 or 5. No need to watch them all at once. On this picking roles she likes issue, like I said the movies she's been in have not even shown up on my radar. That doesn't necessarily mean her roles in them weren't super cool, but it does cast some doubt on either her judgement or her market strength. yeah...if it becomes a chore, I may stop. She was in that one where Tom Hanks was a big tech guy and she decided to stream herself 24/7. ...or your positioning as the arbiter of such things. Judging by what she's been in since the HP movies, I think Noah, Beauty and The Beast, and The Circle all received quite a bit of marketing and wide releases with decent enough numbers. Particularly the Disney powered Beauty and The Beast. The Death of Stalin. Leading Communist dies and other Communists fight for the top job. Good fun. Hotel Artemis. Clarice Starling and the guy from Guardians stitch up criminals around the recycled set of American Horror Story: Hotel. Not much there. Peter Jackson's non-Hobbit film, They Shall Not Grow Old, a WWI documentary. Really high-quality stuff and the making-of featurette after was almost as good as the main show. I'm planning on catching the other showing on the 27th. I wanted to go tonight but had prior obligations. Good to hear it should meet my hopes and expectations. 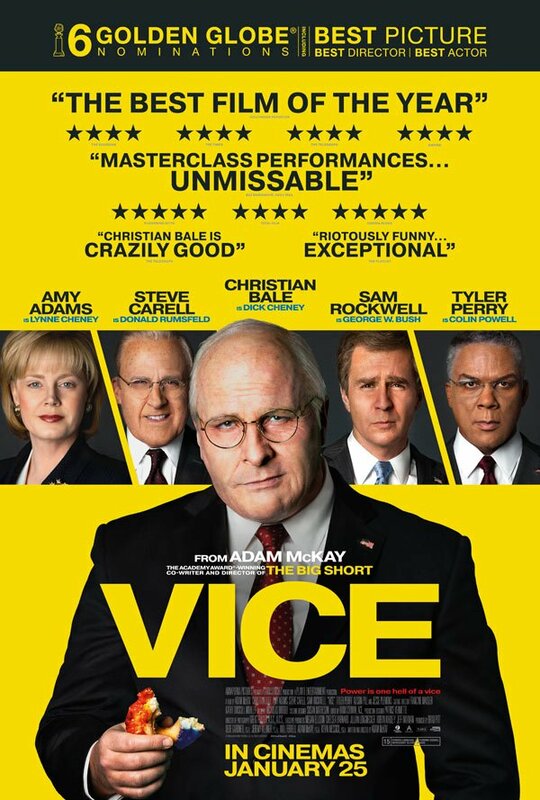 What a creepy transformation for Bale, Carrell, Perry (Rockwell's face is close, but not round enough, I think). That's not Amy Adam's real face, is it?